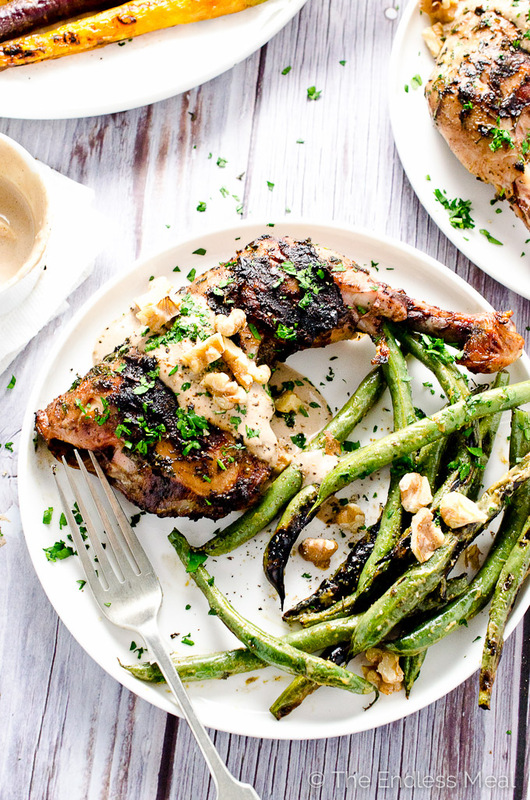 This delicious grilled mustard chicken post is sponsored by our good friends, Maille. All the writing, photos and opinions are my own. If you guessed 34, you win! I promise to share my grilled mustard chicken with you. Hurry over quick to collect your prize; this chicken's too good to last long. Speaking about winning, there's something you guys need to know about. Maille wants to take YOU on an edible journey through Dijon, France, the home of delicious Maille Dijon. One lucky winner will travel to Burgundy, visit the Maille Boutique, be guided on an exclusive tasting led by a trained Mustard Sommelier, dine at Michelin-starred restaurants and visit world famous vineyards. So back to this mustard chicken. You guys, where do I even begin? It's tender, flavourful, extremely simple to make and it's drizzled with a 5-minute, dairy-free mustard cream sauce. It's rubbed with Maille's walnut and white wine mustard that, if you haven't tried it yet I'd suggest getting yourself a bottle asap. It has a nutty and earthy favour with a tiny touch of sweetness. It reminds me a little of black garlic. I wanted to keep things simple with this recipe to really highlight the flavour of this very special mustard. It's very strong and assertive and bold-flavoured dreamy. → sidebar ← Before my box of 5 gourmet mustards arrived in the mail I genuinely did not think that flavoured mustards would be all that different from each other. You know, like you could easily substitute one for another. I was wrong! Very, very wrong. Each of the five mustards I was given has a totally unique flavour. I'm about 100% sure that I'm now going to have to spend all the money I'm making from this post just to buy the remaining 29 other flavours. My two favourites are the walnut mustard and Maille's extra special on-tap white wine mustard. Maille has a line of 5 on-tap mustards that are poured into earthenware pots and sealed with cork stoppers. The on-tap white wine mustard that I got was extra creamy and very strong. It's unmistakably Dijon, but about 100x better than any I've ever tried before. I was tempted to eat the whole bottle, one tiny little spoonful at a time, but came to my senses just before the green beans went on the BBQ. 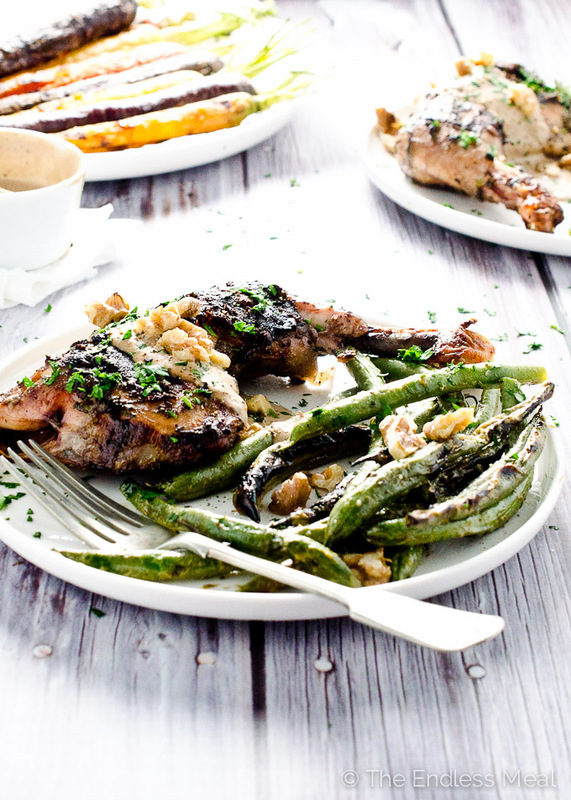 On-tap mustard + green beans + walnut mustard chicken = one awesome dinner. This grilled mustard chicken is tender, flavorful and very simple to make. 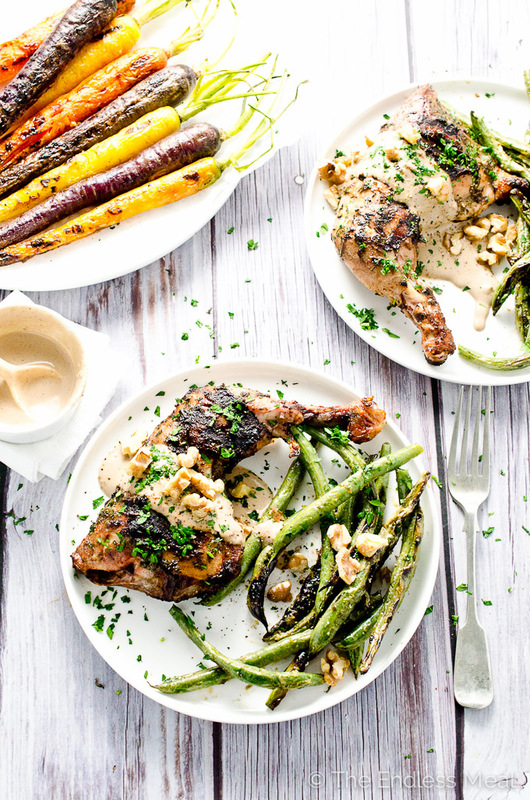 It's served with a 5-minute, dairy-free walnut cream sauce and grilled carrots. Place all of the walnut cream sauce ingredients in a blender and blend on high until it everything is smooth and creamy. Season to taste with sea salt and freshly cracked pepper. Rub the chicken legs evenly with the Maille white wine mustard. Sprinkle the chicken with sea salt, parsley and thyme. Place the chicken legs skin side up on the bbq and let then grill for 15 minutes. Flip the chicken legs over and let them cook for another 5-8 minutes, or until the chicken reaches an internal temperature of 165 degrees. Toss the green beans with the olive oil and sea salt. Pop them on the grill once the chicken has been on for 15 minutes. Let them grill for 5-8 minutes, or until they are tender but still crisp and they have many have grill marks on them. Toss the beans with the Maille on-tap white wine mustard and serve immediately. 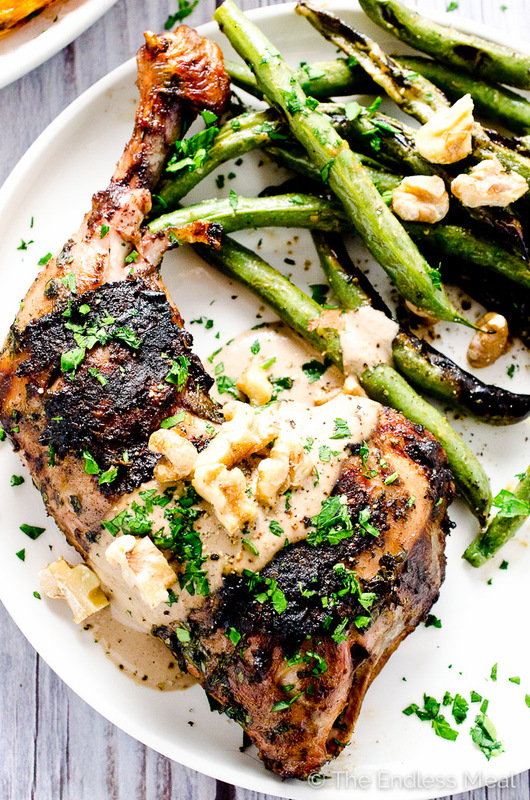 To serve: Drizzle the chicken with the walnut mustard sauce and sprinkle some chopped walnuts over top and the green beans on the side. To toast the walnuts place them on a baking tray and toast them in the oven for 7-8 minutes at 350 degrees. WOW! I always loved mustard chicken. Indeed, delicious! It’s really good! I’m glad I found this page. This dish makes me hungry! I love walnut mustard soo badly. It’s so good, isn’t it?!! It really is a delicious dinner! especially the non-dairy cream sauce I very like it!. Creamy walnut sauce sounds delicious! Your chicken dish looks so good, I’m pinning it so I’ll remember to try the recipe soon! Thank you so much, Shareba! And thanks for pinning too!! I love EVERYTHING about this recipe..flavour, colour, and styling! Must try that walnut sauce. soon. Thank you so much, Angie! It really is a delicious dinner! This chicken looks crazy good! This chicken looks fantastic, especially the non-dairy cream sauce. Holy smokes does this look incredible! And I just love Maille mustards and all their unique flavors. Thanks, Liz! I do too … I was so happy to try a bunch. They are amazing! !